I was a little taken aback reading a March news story about a Tribal panel dismissing complaints against Fond du Lac’s leadership. It wasn’t the dismissal that surprised me it was the casual mention that the Tribal budget is 200 million dollars. According to Wikipedia the Reservation’s year 2000 population was 3,700. Gaming has been good for Chair Diver’s people. I’d be very interested to know what the Rez’s budget was when I arrived in Duluth 40 years ago pre-Bingo. The City of Duluth with a population of 86,000 projects a budget for 2014 of $254 million. Today the band is rich as Croesus which makes their treatment of the Carter Hotel seem a little high handed. Suddenly the once much put upon local native Americans have real financial muscle on their side and Duluth just has pot holed streets. I can’t blame Mayor Ness for trying to get the paltry $6 million (19% of casino profits) back from Fond du lac for our crumbling streets that was lost in Court. Someday I’ll have to read the decision but I’ve got too much time to do anything other than to simply link to it now. But I finally will – at least a little. But first I had to feed my cat Moloch who kept pestering me, then I decided to fix a ham sandwich to give the sprinkler in my backyard a little more time to quench the grass seed I planted to fill up some blank spots where the con man, JB Marvin, beat down my backyard a couple years ago. Then I shut the windows in my office because the City just began drilling into the street with a terrible whine. Oh well, I just turned on Pandora and Barber’s Adagio for Strings is playing……. That’ll help. So what was I going to write….Oh yeah. I had a great weekend. I’d share the photos of my daughter’s wedding but only on Facebook. Her two boys gave her away, (she asked if I’d mind) although when I told the little one what he’d done he retorted, “No, I didn’t.” Sure enough she’s still his Mom. Spending my time preparing for the wedding in advance and ignoring my email through the weekend was a wise decision on my part. Priorities are priorities. That did require me to attend to a little catch up afterwards however. Various household chores came first and today I caught up on the newspapers, including some from this March, which were the last of a thick stack I went through a little before the wedding. I will say this. I find myself spending more time on the DNT than in recent years. This could be because now that I’m on the School Board I feel more need to keep up with local folks. But I don’t think so. I think the Trib has found a new stride and is really giving its readers more local news than it was a year or two ago. I haven’t made an appointment to talk with our District’s finance director yet to have him explain the $13.7 deficits he has projected for 2018. Somehow yard work is exerting more magnetic pull on me at the moment than the future of the Duluth Schools. So sue me. Year by year you can see the end of year finances of the Duluth Schools. The three bolded numbers were, or will be, years of deficit spending or S.O.D. Statutory Operating Debt. I’ll be damned if I can explain why we weren’t declared bankrupt in 2012-13 when we spent $2.9 million more than our revenues. Some fiscal trick I imagine. But it will be capped by three years in which we are projected to have more revenue than expenses. The tide turns abruptly in school year 2017-18 when we fall $4.1 million behind in our revenues compared to spending. As awful as that sounds the following year we are projected to be almost $14 million in deficit over revenue. That won’t stand. The state will intervene. In fact, this is not a worst case scenario. The contract has already made things worser. Our recent contract settlement will up the deficit by a million or more in that final year. That’s almost a sixteen million deficit. If we make no financial cuts in advance of 2018-19 we will eventually have to remedy this scenario by cutting staff. How many teachers would we have to lay off to because of sixteen million dollars of debt? I calculate that we would have to cut 177 teachers! Here’s the calculation, and I’ll admit its very crude: ISD 709 Teachers cost an average of $90,000 in salary and benefits. Divide $16 million by the salary of one teacher, $90,000 to get the number of teachers salaries that would equal a sixteen million deficit. You try it and see if your calculator comes up with a different number. If not that’s what 2018 could hold in store for us. It could be even worse if we heed the anguished calls to bring some equity to Denfeld. Equity will require us to spend more money to hire more teachers to give Denfeld parity with East High School. If we hired five more teachers for Denfeld, a pittance, that would cost 5 times $90,000. It would add up like this year-by-year: $450,000 in year one; $900,000 in year two; $1,350,000 in year three. By year four (2017-18) it would total $1,800,000. However, this cost would have to be added to the deficit which has already been projected for year 5 (2018-19.) That would mean you would have to increase the teacher cuts from 177 that year by another 20 teachers or 197 teachers to make up for the short lived attempt to bring parity to Denfeld. If we lost additional students year by year as they fled to other districts we would lose even more money. 18 secondary kids transferred out would be another lost teacher. Under these circumstances it is easy to imagine draconian 2018-19 teacher cuts heading well over 200 teachers. Perhaps this would not happen. Perhaps the state would intervene and order the District to raise taxes to cover the $16 million deficit. I don’t know exactly what happens. Maybe that’s why some of my fellow Board members and the Administration are so blase about this. We could just be ordered to come up with $16 million in new property taxes and every thing would be hunky dory. Nothing about the Red Plan has ever added up. We were mislead when we were told seven years ago Johnson Controls would only be paid $4.5 million dollars for managing it. The editors of the Duluth News Tribune were mislead when the Finance Department led them to print an editorial saying that the Red Plan would soon hand the School Board $32 million magic dollars. The Trib had to eat a little crow after publishing that claim. Now a projected deficit of $13.7 million dollars is being shrugged off as a wildly worst case scenario. Unfortunately, the Districts track record of fiscal promises has proven unreliable so many times that I have little confidence in their explanations……what little I have been offered to date anyway. At the moment five of seven Board members have complete faith in the financial administration of the Duluth Schools. Now I’ve got emails to answer and a wedding to look forward to. Toodle loo. 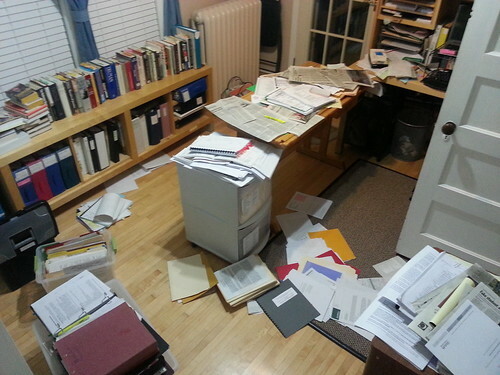 All that paper clutter lies behind me as I type this. I have, as I’ve indicated before, a flood of posts awaiting the lifting of the floodgates. I’m keeping them pent up. Long time readers will recall that I’ve said my family would come first from now on to all of my other obsessions, writing, history, the falling of the Duluth School District into a black hole. Tonight I did attend the end of year fete by the District to honor retiring staff. I had a lovely time that I’d like to elaborate on but won’t because, as the title says, I’ve got a wedding on my mind. Just one anecdote. I saw the principal of Congdong Elementary sitting at the table with a couple from my church. I had gotten a call from the principal a couple days ago responding to a call I’d made a week earlier asking if I might get a tour of the new school. I hadn’t called her back so I wanted to explain that I’ve been preoccupied with wedding preparations. To which the couple from my church teased me mercilessly about using my daughter’s wedding as an excuse. I enjoyed the teasing. The principal graciously accepted my excuse and I said I might drop by for a tour after school was out because I was sure she’d be in the building long after the kids and teachers were gone. About that godawful mess behind me. After I’ve completed this and the following post I will dump it on the queen bed in another room for sorting and filing later tonight or tomorrow morning before my brother flies into town. Its a two day job but I’ll give it a couple hours which will make the job of organizing it all just that much tougher when I finally go through it methodically. It hasn’t helped that my damned cat has knocked the somewhat orderly stacks of papers on my table on the floor a couple of times after I failed to feed it on its schedule. What I will try to do before company comes tomorrow is respond to forty emails that have come my way over the past weeks especially since the DNT made it clear how damaged the course offerings are at Denfeld High School…….anyone remember my heinous comment about gangrene spreading through west Duluth during the campaign? My job is to try to prevent an amputation. Its not going to be easy with the MASH unit I got elected to. That leads me to Post 2 for the evening. Nothing on this list is in anyway disagreeable to me. I like to think that I model this behavior. But I do find it incomplete. It has been used repeatedly in Duluth by the winners of power struggles to shame or attempt to shame the losers. In this it is hardly civil. Civility is in many ways the least of the virtues. In fact some of the items on the pledge do go further than mere civility. For instance “agreeableness” goes beyond the mere formality of civility which demands the avoidance of unpleasantness. Perhaps these nine points add up to something beyond mere civility. I was told this morning that in past years critics of the Red Plan asked that the School Board add “truthfullness” to this list before signing the pledge. Apparently Member Camerons demured saying that there are many shades of truthfullness. I agree with Mary on this point. Truth can be disputed. On the other hand Honesty, which might even fall short of the truth, is a reflection of it. All these points can be faked and someone can put on the masquerade of civility. Sometimes, honesty, can be a bitter pill. For instance it was Jesus of Nazareth who called some of his critics “you brood of vipers!” That wouldn’t pass the “Speak Your Mind” civility test. As long as there is a suspicion that duplicity is masquerading as civility the pledge will be very hard to enforce. Last night at the School Board meeting there was a proposal to raise the requirement to call a special meeting from two people to three people. We were told that this was to abide by state statutory language. Yet when asked for time to confirm that this was what state statute demanded there was a rush to put limits on what a minority of two on our School Board could without waiting for an advisory opinion from experts. As I pointed out this violated the spirit of Parliamentary procedure which attempts to insure the freedom of a minority to express its viewpoints. Its hard to see any civility in this tyranny of the majority. For me civility is all well and good but honesty beats it hands down. If there’s no room for honesty in civility…….who cares about it? Not me! I had, have, a long list of nuggets that I ran out of time to write. Today I was ready to continue these posts but ran out of enthusiasm. I’ve got a dozen emails to reply to concerning bringing equity to Denfeld High but this morning when I still had some vigor I had to meet with some experts to plan our family’s fiscal future unto death. I’m pleased to report that the mortality tables give me another 26 years. Even so, I plan to outlive age 89. Making sure our retirement savings last that long is of some modest importance to meeting that goal. Looking into the future is always a challenge to folks who are consumed with tomorrow’s crises. That’s where the Duluth School District is now. We’re flitting from crisis to crisis. The latest crisis was to pass four years worth of teacher’s contracts for the sake of “stability.” Never Mind that our Business Director handed us a schedule beforehand that shows that we will be in deficit in three years. If we spend even more, by hiring new teachers, we will be in deficit even sooner. If the School Board decides to spend money to equalize Denfeld’s program offerings with those of East High we will simply find ourselves in default even sooner. Not to be a smartass but I’d prefer to take stuff away from East High School to bring their program down to Denfeld’s threadbare level. Otherwise, we will be in default even sooner. Until we meet tonight and I get a chance to ask our Business Director for his suggestions how to avoid bankruptcy I’m disinclined to answer all these emails. For Minnesota School Districts bankruptcy is called SOD (Statutory Operating Debt). When I began running for the School Board futilely in the early 1990s we were in SOD. The School Board of that Era chose to stop funding all Duluth Extracurricular activities one year. That’s an option. Instead of writing posts or replying to email under these circumstances I asked Claudia to take a long walk with me in the very welcome sun this afternoon. When we got home we sat on our sunporch and cracked a bottle of wine. It hasn’t solved our District’s current crises but I’m not gnashing my teeth quite so much. I got an email from our Chairman this morning who told me that by all means we should talk about our budget. He just didn’t want the school board to talk about the past, the Red Plan or our teacher contract settlement. He’s discouraged too but, the way things are headed, he ain’t seen nothin yet. These days we are reading that our schools across the nation are more segregated than ever. Ditto Duluth. In Duluth, however, the critical division is more between rich and poor than racial segregation. That is spelled out in the Editorial that I linked to in the first nugget. I’m down to about twenty minutes before I leave for church so my nuggets will get more crammed together and more nuggety. 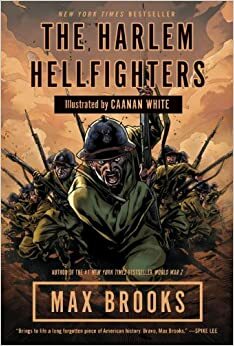 I just finished reading the much touted graphic novel, The Harlem Hellfighters. More on the Hellfighters in coming posts…… Although its a subject I once alluded to in a much earlier Lincolndemocrat post. I’ve commented briefly about the Spanish 5 classes. I’m sure that the Board will now be shamed into making sure Denfeld students get that class just like my daughter did twelve years ago. I’m just not sure what we will take away from our schools to fund it. Meanwhile the Trib’s Jana Hollingsworth wrote a telling and terrible story about something I’ve wondered about since the Red Plan juggarnaut began in 2007. Along with the elimination of the Curriculum Department and languages we have gutted music and Jana explained the destruction with precision. According to the story we have half the music teachers we had when we began building the Red Plan in 2007. We had 31 then and 15 now. Music was the glory of our Schools when I was on the Board. Now, not so much. Good luck replacing that when we are SOD out of luck. Our Finance guy has a “formula” that explains that worst case scenario. At the moment there are only true blue curious school board members who want that formula explained so we can take corrective actions to prevent the worst case from materializing. Here’s a tip. At the moment one of these two grouches has started to attract lots of sniping from the School Board majoritarians who are all addicted to happy talk. The targeted grouch is Art Johnston who pointed out recently that Johnson Controls got paid millions of dollars in change orders that the Duluth School Board never got a chance to vote on. So far, I’ve been held harmless so far even though I wrote a similar complaint to the still silent State Auditor Becky (I see nothing) Otto. I’ve told our Board that we are a team but the more I see I think we are a team like the survivors on a lifeboat who will soon have to draw lots to figure out which of us will be put on the menu so that we all don’t die. Here’s a cheerful tune for you. Buddy Can You Spare a Dime. Are there more solutions? I started my first nugget with a couple. Here’s another. We could cut all our extracurriculars. When I began futilely running for the School Board in the 1990’s as we went into SOD that is what the school board decided to do. The City rose up and passed the hat saving the entire extracurricular program. One of our student Board members has been lobbying to add Debate to our schools. I wish him well. When my wife Claudia and I joined the Superintendent and his wife Deanna at a recent fundraiser we compared notes and discovered that three of the four of us were on high school debate teams. We used to have them in Duluth. Will we have them again in a new era of Statutory Operating Debt? I can no longer put off visiting our new schools. I’ll confess that my PTSD from fighting the Red Plan left me very reluctant to visit these new schools even though I once predicted they would be very nice. It was a little like not wanting to hold a beautiful baby that was imposed upon me by force. I’ve gotten over that. My job, my very tall job, is to make our schools whole again. That means I’ve got to start checking them out. Those I’ve toured so far are beautiful. Piedmont is extraordinary. Yes, it sits on a postage stamp with even less open play field than the original but the school is amazing. I felt like my old one time buddy Tim Grover who was always such a stingy Board member but who, when we first walked into the then new Lowell Elementary gushed, “There’s nothing as fun as a fresh new school.” No kidding. I had hoped to get all the tours in before the close of the school year but I waited too long and that won’t happen. I have checked out the new Eastern Middle school (formerly East High) and gotten the full Monte tour of East High. Both are spiffy. While there I bought a jar of maple syrup which Jenny Madole’s class tapped from maple trees on the periphery of the school’s property. I spent a good hour and a half there with Principal Laurie Knapp’s personal tour. She started out in the football field where the Physics classes were shooting off rockets. One nearly landed on my Traverse in the parking lot. It was on a parachute. With but one exception the faculty I was introduced to were warm and welcoming. The exception was a cool glance I got when I peeked into one class taught by a DFT big wig. I asked Ms. Knapp if there were 45 kids in it. “38 or 39,” she suggested. I’m not sure if my reputation as a teacher hater or the hubbub of 38 kids turning in projects explained the aloof greeting. When we hit SOD (statutory operating debt) with that projected eight-figure deficit when I run for reelection maybe his classes will be at 45. I’m indebted to Loren Martell for writing a review in the Reader Weekly of the most critical school board meeting I’ll have attended in the four years of my service on the Board. Because it wasn’t our monthly meeting we didn’t video tape it for later posting on Youtube. I’d forgotten the Superintendent’s description of Bill Hanson’s financial forecast as being a “worst case scenario.” Of course it will be even worse with the acceptance of even more pay for our staff than the forecast outlined. “If a contract is brought to us that I view as destructive to the District and our children, I will make that case in public with particular ardor. We were given a ten-minute preview of our future in January during our first budget meeting. The year I will be facing the voters again [2017-18] we have a projected $13.7 million deficit… I worked very hard to persuade people we would be in a dire situation if we did not add $1.8 million with that levy [approved by voters last fall] so we could try to keep our classrooms from getting any more crowded than they are, 40 to 50 kids in some of the high school classes. You cannot teach that way. So if this is, indeed, “Treat Our Teachers Decent Week,” accepting a contract which is going to cram more kids into the classrooms is no way to treat them decently. The superintendent and Board chair did not deny that the doomsday deficit numbers Member Welty referenced were indeed the projected estimates of the district’s finance department, but argued this was a “worst-case” scenario. I’ve got an hour before Church and no time to fully open the floodgate of posts pent up inside my poor bursting head. Fortunately there is nothing like a “Duh” editorial in the Trib to make my typing fingers itchy. Let the flood begin in little waaaay to short bursts. They’d be longer but I’ve got got a daughter getting married in a week and my mind is preoccupied. That’s not the way it was supposed to be, with haves and have-nots, east vs. west, Denfeld pitted against East. The Duluth school district’s Red Plan, with its controversial closing of Central High School, was supposed to result in equal offerings and opportunities at both the remaining schools. There was supposed to be balance in student enrollment and balance in demographics, including family income. reduced-price lunches. The percentage at East is just 21.7 percent. Or this? While Denfeld has about 1,100 students, East has about 1,600. That means more money for East for offerings like Spanish 5 as money is distributed on a per-student basis. What the F*** are we supposed to do DNT? A. Yeah, we could ruthlessly enforce a new 50/50 boundary. That’d be fun. B. We can wait until Edison builds a new high school. (perish the thought that we would sell Central) Four years later 500 happy Edison children will be in our new charter High School. If its students were all subtracted from East then we’d have a Denfeld at 1000 students and and East at 1100 students. Uneven population solved! C. We could only enforce the closed lunch at East and give kids who don’t want to be imprisoned in a pre-college castle an incentive to transfer to Denfeld. D. We can retract our approval of a teacher’s contract that will add another million or so bucks into bankruptcy in the next couple of years making what Supt. Gronseth called a “worse case scenario” even worse when we face a 15 million deficit instead of a mere $13.7 million deficit. Oops. Too late to do that. Worse Case scenario coming up. I could keep going offering ideas but no time…..next nugget coming up. A glitch in my email, wedding preparations, and general confusion have left me to neglect some parental email lobbying to preserve Denfeld’s Spanish 5 classes in the name of equity between our highschools. The email was sparked by this story and this youtube. I hope we keep the equity up at Denfeld where its always supposed to be a good time. The second half of a story on NPR got me thinking today as I drove in the dark to McDonalds for an oatmeal and coffee. It was about the recent slaughter of forest elephants in the Central African Republic. It was produced by the same NPR reporter who visited the forest twelve years ago to record the sounds of these elephants for a report I well remember. The killings were for the ivory trade which is rapidly reducing elephants to those hidden behind bars in the world’s zoos. Its a surprising story and in some ways a heartening one but it illustrates the disquieting fact that there is nowhere in the world now that nature is safe from mankind. I was thinking about the unknown elephant killers. Apparently they were from the Sudan no the Central African Republic. That would be a little like folks from New York traveling to Nebraska to poach. Photos of African child soldiers are all over. These soldiers were likely kids who were kidnapped or who were orphaned and drummed into local insurgencies. Such soldiers probably account for the 300 Nigerian school girls whose only fault was choosing to go to school and being rapeable. There is a ridiculously thin veneer of religion used to justify this crime. The kind of justification a child might use for pushing his littler brother over a cliff. Africa is full of abandoned children. All throughout sub Saharan Africa there is a sentiment that explains kids that can’t be taken care of by their families as being possessed by demons. You can find shades of this wherever children are neglected. Why are one third of America’s black boys fated to be sent to prison or jail sometime in their lives? One thing I was confident of as a child learning about the Holocaust was that a civilized world would never let such a thing happen again. Imagine my shock when as a climax to the Vietnam War a shadowy group claiming ties to communism as tenuous as Boko Haram’s are with Islam rounded up the entire population of Cambodia and marched everyone under armed guard to the jungles and made them “farm.” Rather than let everyone starve Pol Pot’s soldiers, many of whom were war orphans who had grown up with guns in the forest, gave their Kalashnikovs to city raised children with orders for them to shoot their parents. A gun was trained on the murderers-to-be’s heads so they had little choice. William Golding’s remarkable little novel “Lord of the Flies” portrays civilized children left to their own devices on a desert island becoming dangerously feral. I’d suggest that abandoning children to adults in war is a surer path for them to become disciples of Hell. I’m sure this was true in China in the time of the war lords and at every other Era in the world History where mayhem ruled. Civilization is a fragile tissue easily torn. Abandoned children are a tear (rip) ready to happen. They will join gangs rather than starve, shoot elephants, kidnap school girls, you name it. But its not just abandoned children that we have to watch out for. Recent analysis of rapes on college campuses, hardly the province of abandoned children, suggest that most of the thousands of reported rapes are the work of about 6 out of every 100 college men. These fellows must be the kind of people, who during war, know how to put abandoned children to good use or run concentration camps or maybe, in peacetime, who become prison guards, corporate CEO’s or sometimes ministers. When we put one-third of all black American men in jail I don’t think that advice is being heeded. It would probably require a “Christian” nation to put that advice into practice. I didn’t want to harp only about the bad news at our Tuesday meeting. (Darn it. I can’t find the story on the Trib’s website and it looks like I failed to clip it a couple days ago in my paper). So I brought up the very good news that the state Senate agreed to OK the bailout of (DTRFA) the Duluth teacher’s pension. According to a note we got from the District’s lobbyist it will cover a nearly $157 million in a shortfall that many were saying Duluth voters should be forced to cover at a cost of perhaps eight million a year. Crikey! I thought it was a proposal that wasn’t going anywhere and I was ready to beat up our legislators for not helping us cover our financial behind. The verbiage has to be worked out between the to House and the Senate and the Governor still has yet to sign it but it looks like a done deal. If its not done it won’t be pretty. If my back wasn’t so sore from typing I’d have more to say about the pension…….oh well. Speaker Reed beckons. Shielding Johnson Controls from public scrutiny is an old habit that just won’t die. Perhaps a few of my readers read the piece my colleague Art Johnston wrote for the Trib a few days back. Here’s the gist: JCI got a change order for millions of dollars that was never presented to the School Board for a vote. Tsk, tsk, tsk. Art has written to the State Attorney General about it. I wrote to the State Auditor about it. Here’s my letter to Becky Otto. I am a newly elected member of the Duluth School Board as well as a past member with eight year’s service. During my previous experience our School Board adopted a policy to have audits performed by the State Auditor’s Office once every five years . Although this is still our policy we have not asked for such an audit for well over a decade. Generally, the governing body of a public entity, as a whole, must approve the expenditure of public funds. The decision to expend public funds should be based upon a formal vote of the governing body that is memorialized in the meeting minutes. On occasion, an elected official will authorize a payment on behalf of their public entity without first obtaining approval from the governing body. A public official who individually agrees to a payment of public funds runs the risk that the governing body will disagree. When that happens, the public official may be personally liable for the payment. This has happened in Duluth numerous times in recent years as our School District’s Business Office has paid millions of dollars to a Construction manager, Johnson Controls Inc. on the signature of lone School Board members with no public vote or discussion. A fellow Board member and I confirmed this state of affairs recently but only after your newsletter prompted me to send a question to our District’s Finance Director, William C. Hanson. I’m enclosing copies of the complete emails but this is my critical question and the reply from Mr. Hanson. Have there been any occasions that you can recall that might put current or past school board members at risk under the State Auditor’s Point three on this email? I am enclosing a chronological list of change orders and payments approved in this fashion through the course of the building project in question of which no record can be found in ISD 709’s school board minutes. The change orders will also be provided. If this has not been a part of your audit in response to the â€œcitizens petitionâ€ I request that you and your staff investigate this matter now. I hope Becky follows up. My Grandfather, George Robb, was the Kansas State Auditor for 24 years. He was a stickler for financial integrity. The nastiest and most misleading campaigns are being led by Mr. Glass and Mr. Welty. In addition to their bitter attacks on the Red Plan, Mr. Welty and Mr. Glass are viciously attacking Johnson Controls, the company hired by the school board to conduct exhaustive studies of every school building, and to organize hundreds of public community sessions to get input about their findings. “But Mr. Glass was wrong. So, the following day, June 19, the News Tribune published a front-page story of clarification. It turns out that Johnson Controls got $250,000 for the study and follow-up activities, and could possibly earn another $4.5 million for managing projects. Undeterred by the fact he was $28.9 million off the mark, candidate Glass continues his reckless attacks on Johnson Controls. Doty had four months to correct Glass based on the other Forum Communications publication the Tribune. He chose to unload his buckshot three days before the election when there was no chance for a rebuttal. Since the Duluth News Tribune has not, to my knowledge, asked anyone from the District what JCI really did earn from the biggest public school building project in state history since July of 2007 I’d really like that figure reported. I’ll probably be asking it myself soon at a Board meeting. Last I heard they said its 2 percent. I’ve had very few moments of anxiety since 1. I decided not to fret about the abyss the School Board was about to jump into so blindly and 2. found out from the Doctors that my heart is healthy. I’m not reconciled to the District’s state of affairs but I’m back in the mode I was put into six years ago when JCI and the Red Planners worked overtime to keep me off the Board. That mode is a patient biding of my time. I couldn’t get elected until the Red Plan proved a disaster. In three or four years with escalating class sizes I hope to be in a position to persuade our teachers that they really would prefer to be able to teach than be paid handsomely to babysit a madhouse. By the way the teachers weren’t asked before the contract negotiations whether they would prefer smaller classes or more money. The union leadership decided for them that it would be more money. It will be interesting to see how many elementary teachers will be asked to teach split classes next year (two grades in a class). Their reward for this sacrifice? $500 big ones. Whoopi ding! I indicated in my post this morning that the floodgates are about to open but not quite yet. My daughter is getting married in three weeks and she asked me to make some fun things for her wedding. Until today I couldn’t set time aside in my mind to work on them. I got started today. Among other things she wants me to make a small topper for her wedding cupcakes – the car from the board game Life. I’ve been thinking about how to go about this for two months now. The school district, my blog, my fix up of the attic, can all wait. I also want to continue my foray into the 19th century reading about its politics. After my book on Speaker of the House Reed I think I’ll open the Pulitzer Prize winner by Meacham about Andy Jackson. Not that the District is going away. I spent the day of the contract vote clipping a month’s worth of newspapers and filing them into folders by month and year. While Claudia is away tonight (at the seminary) I may begin rereading the School District articles starting back in the late 1980’s when I began collecting them. I know that there are a lot of folks who tell me we shouldn’t look back and obsess about the the past. The Red Plan is over after all. Trouble is, you can’t stop people from looking back. For instance, a lot of the Red Plan supporters never got over a failed building bond referendum in the mid 1990’s and were thrilled to get payback on the old codgers they blamed for defeating it. Thrilled all the way to 50 kids in a classroom. There have been a spate of testy emails in the School Board email about whether we should televise meetings other than the one official school board meeting we hold each month. I closed the emails before reading them through. Sheesh! I’ll probably oppose televising them generally due to our fiscally straightened circumstances but there should be exceptions. Last Tuesday’s meeting was the most important meeting we are likely to hold for the four years I’ll be on this Board. We dug set our course and the public really should have been able to witness it. It should have been televised. In fact, an old Red Plan critic did film it to play back on Duluth’s PAC channel. I asked her to make a copy for me so that I could upload it to Youtube. It’ll be up in a couple of days. I can’t guarantee the sound quality or production values but I’ll let my Readers know when its up. I am the floodgate of a reservoir about to burst. I have bottled up a lot of thoughts over the past six months. They’ve got to start spilling out soon and here on the blog is a good place to spill them. But I’ve also been thinking about writing a book about the Duluth School District and Education and our current troubles. Its perhaps the third book I’ve contemplated writing about the subject of the schools in Duluth. Will I write it? I think so but maybe I’ll get hit by a car tomorrow and lose my focus. I’ve been contemplating a writing career to finish my life for the past decade or longer. The Blog has simply been good practice rather like scales for a beginning pianist. Its been a lot of scales. John Hay’s and John Niclolay’s ten volume history of Abe Lincoln that they spent fifteen years pounding out comes in at 1.2 million words. I’m sure Lincolndemocrat exceeds that by an easy doubling of verbiage. Like I said, that’s a lot of scales. To the sake of becoming a writer I’ve been eyeing my attic for many years and fighting with Claudia about turning it into an office. I recently “won” the argument when I gave up our going on a 40th anniversary river cruise through Europe this summer. I’ll spend the money instead on fixing up the attic. Its not the first time my headstrong selfishness has cost Claudia. Every one of my fifteen campaigns for public office leading to twelve discouraging defeats has been a cross for her to bear. That may explain her foray into a seminary these days. I’ve got a lot of things I’d like to write at the moment of a more bloggy nature than booky nature. Today I may start a column for the Trib in light of our recent contract settlement. I’m thinking about calling it “What ifs?.” That’s a response to a brief conversation I had with the Trib’s education reporter, Jana Hollingsworth, who told me quite rightly that my prediction of a grim future for the District was pretty speculative. I replied that five years ago I predicted that we would spend down our once formidable reserve (it was around $30 million at the time) to zip. Just as I was confident that that earlier prediction would come to pass…..and it did, I’m pretty confident that without some vast mid-course corrections we will end up in Statutory Operating Debt (bankruptcy) in four or five years. That’s a lot to write about so for this post I’ll just warm the kettle. When we got home from a delicious breakfast at Sarah’s Table this morning I found the attic door open. Claudia was putting some things away and our cat Moloch had gone up to hide in the playground it affords him. I decided to go up and survey the attic as I try to figure out how I want my new office to be laid out. I paused in front of one of several bookshelves we’ve put up and perused some of the many books I’ve acquired. My eye alighted on the book by the early Renasaince Scholar href=”http://en.wikipedia.org/wiki/Desiderius_Erasmus”>Erasmus. I don’t remember buying it but I’ve always been an omnivore where books are concerned and probably found it at a book sale. I am not that familiar with him but I’ve read about him in passing many times. He was quite the intellect. I pulled the book out opened it up at random and began reading a paragraph which presages my own thinking about humanity. I’ll quote it in a moment. It was rather like the passage I read 40 years ago or so when I decided to read a passage from the Bible at random every day for the rest of my life. That decision lasted all of one day. What I read then I recall as something like: “He who calls another man a fool is a fool himself.” That was a brilliant passage and was perhaps all I needed to make use of my aborted plan to read the whole Bible. By the way, I’ve never found a Bible passage in any concordance that has the quote as I remember it. Pity! Erasmus did all his writing in Greek and Latin which put it beyond the common man of his Era and led to a very small circle of readers. Fortunately for me, a bonehead who speaks but one language, its been translated into English. If and when I get down to writing my Unified Theory of the Duluth Schools I plan to write it in English. I’m not smart enough to write it in educationese or accounting bafflegab. We have a Board policy, it was around when I served on the Board a decade ago, that forbids school board members from predicting the outcome of a vote. I ignored it then because it was stupid and it still is. Tonight the School Board will vote on and approve the Teacher’s Contract. This means I’m in good company. Recent Boards have a habit of ignoring Board policy. For instance, I was just kept out of a teacher’s contract negotiation despite the policy that says all Board members serve on the negotiations committee. My volunteer, now far away asked me about what seemed to him a reasonable contract. Here’s our email conversation. Cool. Please tell me more about why you are opposed to the new teacher’s contract. It would seem, on the face of it, to be very reasonable on their part, what with such small annual cost of living adjustments. The budget forecast for four years from now when I would run for reelection is a $12 million deficit. That is more than twice as many fired teachers than the recent levy will allow us to hire. Is there no other way to save money/bring money in? Unhappy teachers = unhappy students = unhappy parents = further tax revolts, n’est ce pas? Now that I know the “meat and potatoes” statistics, I find myself in agreement with you. Do all school districts spend such a high percentage of their budgets on labor, or is Duluth different in some way? 80 percent of our expenditures are for labor. Our teachers wages are 15th highest out of 300 district’s in the state. We can either have more teachers with lower wages or fewer with higher wages. With 40 kids in a class we have opted for the wrong formula. In closing I’ll note this: We can either pay our teachers more by having fewer of them or we can have more of them by paying them less. We will be having fewer of them in Duluth with this contract. Once again I’ve woken at threeish in the morning with the School District on my mind. My plan was to edit the last post which took two hours to crank out from 3 to 5 AM. But my heart isn’t in proof reading. I went downstairs to give our cats some very early morning food mostly to assure that they don’t start howling and prowling and wake up my grandsons who stayed with us last night. They are clever like that. If I won’t wake up for them then they know I’ll wake up for the boys. I also checked on the laundry while I was in the basement. Drat, After putting in the last load in the washer I forgot to push the start button last night. My Grandson’s took up most of my day yesterday as they likely will today. There was a very interesting column in the Trib which I set aside and still haven’t read. Its by Art Johnston and on a topic we’ve discussed a great deal. I got several emails regarding it but I haven’t read them either. I will do so soon perhaps this dark morning and comment on them here but until now I’ve not wanted to draw my attention away from my loved ones. After attending a funeral yesterday morning of one of my old allies, another last remnant of the old RINO GOP, I found that my future son-in-law had left me a phone message inviting me along with the gang to the Public Television Fun Fair being held at out newest Middle School, Lincoln. I dressed down and hurried over in time to join the boys and my daughter for hot dogs. While sitting under the central open space in the building I looked up to see if I could spy the failing gusset plate I’d heard about from a structural glitch in the building’s making. Sure could. I was right under it. If you read the paper you may have heard about it. We’ve known about the bowed out plate for months. It may have been caused by all this winter’s snowfall pushing down the brand new roof. Its been circulated quietly among the School Board but despite a threat which caused at least one athletic event to be canceled when it was discovered we’ve grown complacent with early suggestions that its not a big deal. The architects of the building reportedly weren’t eager to get too much attention. I discovered why a week ago when I saw that LHB had pitched the Superior School District on their own version of a scaled down Red Plan for $70 million or so. That Gusset wouldn’t be good advertising. Like a lot of other stuff that doesn’t fit in with the positive spin our District understandably wants spun the suspect roof is unwelcome news. That doesn’t excuse us from bringing it to the public’s attention, however. As I found myself being strung along by the District’s powers-that-be in my futile attempt to ……damn cats, I fed them but they are back up here howling anyway….my futile attempts to understand our budget and the assumptions underlying our contract negotiations I got thinking about the terrible position the school board would be in if the roof actually failed. Knowing that the roof had a glitch and saying nothing about it would have made us all accessories to a potential calamity. Screw that! If the powers-that-be were willing to risk children walking under that roof they ought to put their names to that decision publicly. That, of course, meant me too now that I’m part of the power structure. I’ve not written about my stringing along over the past month because I’ve tried not to be a pill. Diplomacy you know. But I have some serious grievances. Like Abe Lincoln I’ve written a couple scathing pieces for inclusion on this blog or the Duluth News Tribune or to read at a school board meeting only to fold them up and hold my tongue. That was one of Lincoln’s secrets. It allowed him to vent but like counting ten it kept him from burning bridges with words he could not later take back. I have given two of my rants to the Superintendent to make clear how I was feeling but without making them public and putting him on the defensive. A couple weeks ago after some clumsy fun and games about when we as a school board would meet to vote on the contract I took one of the held back pieces and hand wrote a hard edged little note explaining that I was so angry I planned to tell the Trib about that gusset plate and suggested that the trib be apprised of it before I weighed in. The Lincoln Roof made it to the paper the next morning suitably downplayed to keep the public from alarm. When I get around to reading Art’s take on another issue of accountability I’ll have plenty so say but this is my weekend with the kids so I’ll take my sweet time responding, thank you very much. When I opened up the computer and went on line this morning I found the latest Google logo honoring actress Audrey Hepburn’s 85th birthday. It took me to a short video about her stellar performance in the movie Breakfast at Tiffany’s which I saw with my parents back in grade school before I could deduce that it was about a love affair. The music in the video was the melancholy Mancini melody, Moon River, which I occasionally sing to my Mother. Like so many other things in my 63 year old head the clip flashed a dozen recollections successively. I thought of Buddy Ebson who showed up in the movie and how he later was the lead in Beverly Hillbillies and how he missed the chance to be the Tin Woodsman in the Garland movie the Wizard of Oz which I tried last night to get my wife to let our grandsons watch. She doesn’t want to because she thinks its too scary. I thought about how Frank L Baum the author of the Oz series had written an infamous editorial calling for the eradication of Indians, Geez. That’s quite enough already. My discursiveness can be so undisciplined. I did find a few minutes to begin yet another history book while out of sight of my Grandsons. Its Mr. Speaker by James Grant. Its about the remarkable career of Thomas Reed who became the first Czar of the House of Representatives between Reconstruction and the worst excesses of the Gilded Age. I learned of him in junior high when I read JFK’s book Profiles in Courage. The president had been assassinated when I was in seventh grade and I was under my Grandfather’s spell to read history. We had urged our Grandfather to go to a Medal of Honor Convention in 1962 that was called together by the new president. I have a lovely picture of the two of them shaking hands at the Rose Garden. When I was a kid my Dad (his son-in-law) and I were talking about history. One of us challenged him to list all the presidents from Washington to Lyndon Johnson in order. He did it with no hesitancy. That’s not all that surprising. His family was steeped in post Civil War politics. There is an old family story about the time my Grandparents, Winona and George Robb, arrived late at a Robb family gathering. When My Grandmother asked if they had missed anything a sister-in-law told her not to worry. The men were talking presidents and were only up to Warren Harding. Speaker Reed’s contribution to politics was to take a dysfunctional Congress and turn it into a lean mean legislating machine. That seems a suitable goal for me to contemplate for the next four years. Enough of the sweeping things under the carpet.